Yesterday, an elite prospect by the name of Nikita Filatov decided that he wanted to go finish the season playing in his homeland of Russia. The reason for this is mainly due to the lack of ice time and opportunity that he was receiving in Columbus. Through only 13 games played, he averaged only 8:06 on the ice. During a season where there are many rookies being given opportunities on their team’s, the 6th overall pick of the 2008 NHL Draft has been stuck playing for a stubborn, defense-first coach, who has a history of being unwilling to work young talent into his system. Let me first say that this is not a situation like Nikolai Zherdev or Sergei Kostitsyn where it is based on money or AHL playing time; it is widely known Filatov has a strong desire to play in North America. The fact is, the Blue Jackets never intended on sending him down to Syracuse of the AHL this season, no matter how little they used him. Unlike most younger Russian plays, he is already fluent in English. When he was told he was not strong enough, he bulked up his frame 20lbs to 185lbs during this past offseason. That increase for his size and age is remarkable. I would have thought that this obvious dedication to improvement, combined with what people have called “Kovalchuk-like” talent would have given him more ice time in Columbus, especially with the injuries that they faced early on. That was obviously not the case. Hitchcock’s system has been a defense first game in which the more experienced players are always given a bigger role and more ice time than rookies, no matter how talented the rookies are. When Rick Nash scored a League high 41 goals in 2003-04 (his second season), he was the fourth highest forward in ice time, and fourteenth highest on the team. I don’t necessarily disagree with this coaching style when you are dealing with any random player, but not when you have a potential superstar on your hands. In that case, systems should be adjusted in order to help that player excel. Instead, Hitchcock had him buried down on a line with grinders Derek Dorsett and Jared Boll. Filatov was told he needs to be stronger on the puck and cut down on his giveaways. First of all, how is an offensive minded player supposed to have a chance to progress with 8 minutes of ice time per game in a grinder situation, where he is benched for elongated periods of play. Secondly, according to NHL.com, Filatov only committed two turnovers in the limited role that he had; Kristian Huselius, commonly known as a defensive liability around the League, has eleven, yet he is averaging almost 18 minutes per game. With a player like Filatov, who has ability that everyone talks about, a coach has to learn to let him fail. You can’t put them out in situations where they aren’t experienced, and then bench them when they don’t live up to your expectations. If you look around the League right now, you see Del Zotto, Kane, JVR, Tavares, Duchene, O’Reilly, Demers, Myers and Bergfors, all rookies on their respective teams, but all being put in situations in which they have the skill to succeed in. Del Zotto is succeeding because he is labelled as a powerplay quarterback. Throw him out there with Marc Staal on the penalty kill, and I am sure he would not be so highly thought of right now. It was not very long ago that there was a similar situation with another highly skilled to prospect. Everyone said he was over matched, not strong enough and had lost his confidence. But there was no chance that the prospect was going to be sent down, no matter how often the coach at the time benched him or scratched him. But once a new coaching staff came on board, they took a new approach to the kid by standing beside him and working with him, allowing him to not only see the outcome of his failures, but actually have a chance to make up for them. If you haven’t guessed, I am talking about Steven Stamkos, who currently has 13 goals and 21 points in 18 games. I also think that some of the blame should be on the communication, or lack of, between general manager Scott Howson and Hitchcock. Remember, Hitchcock is not “Howson’s coach”, he was hired by former GM Doug Maclean. It is very common to see a new GM brought in who wants to hire a coach based on their own qualifications, and therefore fire the current coach. That did not happen when Howson replaced Maclean, but I am just acknowledging that there might be possible tension. So knowing the system that Hitchcock has in place, why in hell would they draft a purely offensive minded player like Filatov. If proper communication had occurred, they could have realized the work that was necessary for him to earn a spot in Hitch’s lineup, and could have drafted someone else that fit the bill, like Colin Wilson or Cody Hodgson. Now they have an elite prospect whose return to the team, although under contract for next season, is in jeopardy. Now a Russian player, who is probably not very fond of the coach, will to come back to camp next season with hopes of grabbing a top 6 spot. But you have to think that he is now in Hitchcock’s doghouse even further. I have a feeling that, if Filatov’s desire to play in the League is true, then it will likely be for a different team than Columbus. 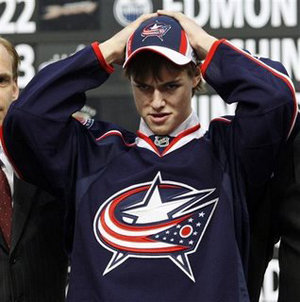 This entry was posted on November 18, 2009 at 5:49 pm and is filed under Columbus Blue Jackets with tags columbus blue jackets, ken hitchcock, khl, Nhl, nikita filatov, scott howson. You can follow any responses to this entry through the RSS 2.0 feed. You can leave a response, or trackback from your own site. All you need to do to piss off DP is to call back a goal against Detroit.